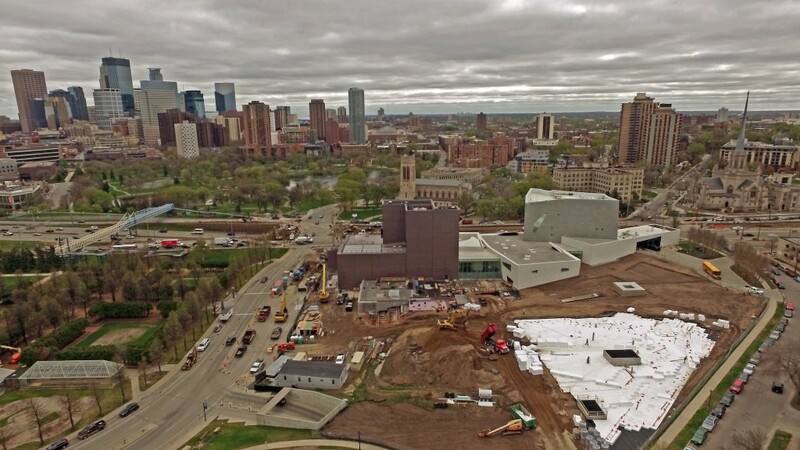 With the Walker’s new entrance and plaza opening in just five months, and a year until the grand reopening of the fully renovated Minneapolis Sculpture Garden, we’ll be publishing monthly updates from now on to catch our community up on new developments in our ambitious campus renovation project. In this month’s update: ground is broken, new sculptures take form, and a reshaped hillside emerges. The new landscaping has been designed in a way that embraces the site’s natural hydrology. The new “fresh meadow,” filled with deep-rooted native plants (see the illustration below), will absorb stormwater runoff while providing an attractive visual locus on the garden’s north end. Meanwhile, throughout the rest of the garden, “enhanced turf” — turfgrass with a specially engineered, sandy subsoil — will increase stability while also providing better drainage. Stormwater runoff — frequently a source of pollution in urban areas — will become a resource for the sculpture garden. An 80,000-gallon underground cistern will hold captured stormwater runoff and excess water from the famous Spoonbridge and Cherrysculpture. From there, it can be pumped throughout the site to water the sculpture garden’s landscaping as well as the adjacent baseball field. 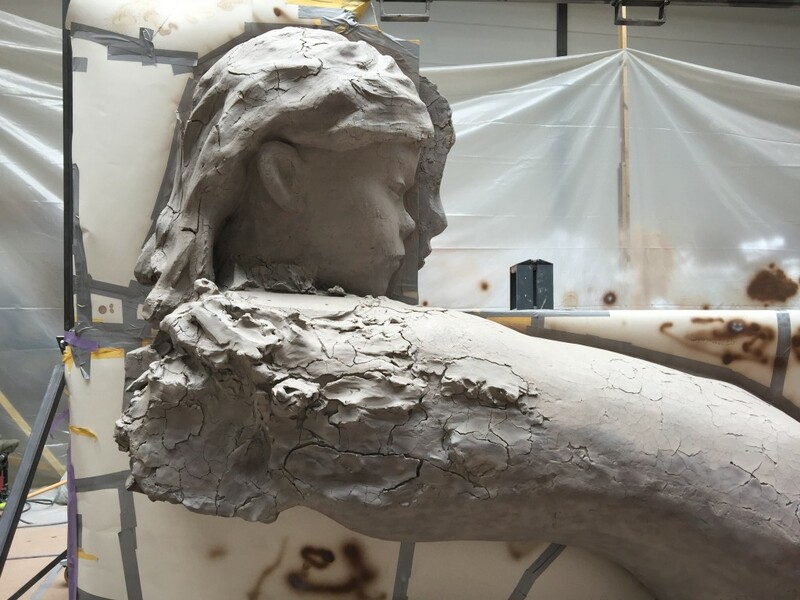 Works in Progress: With five commissioned works slated for the renovated campus, studios near and far are abuzz as new sculptures are being created. 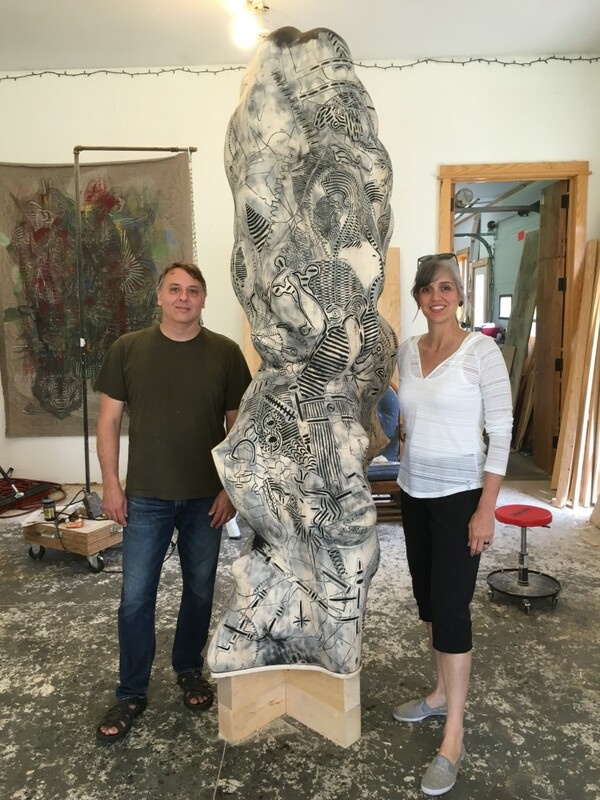 Olga Viso checked up on one, visiting Aaron Spangler’s Park Rapids, Minnesota studio to view the basswood sculpture that’ll eventually be cast in bronze. Meanwhile, curatorial assistant Misa Jeffereis traveled to Ronse, Belgium for a tour of Mark Manders’s studio. For his commission, Manders began with molded wet clay and wood and then cast the forms in bronze, before painting them to look indistinguishable from the original components. Moving Art: Now that Sol LeWitt’s crosswalk is reinstalled on the Walker’s rooftop terraces, other works can resume their place alongside it. In mid-June, Claes Oldenburg’s Geometric Mouse — Scale A, last on view in late 2013, was reinstalled on the terrace next to LeWitt‘s Three x Four x Three (1984). 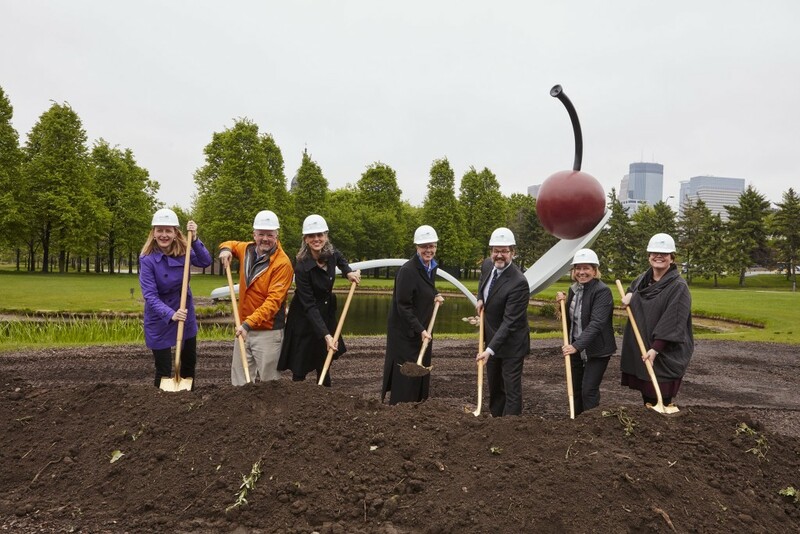 Meanwhile, most sculptures have been removed from the Minneapolis Sculpture Garden as work begins on renovating the green space, with only a few—including Oldenburg and Coosje van Bruggen’s Spoonbridge and Cherry (1985–1988), LeWitt’s X with Columns (1996), and a tree planted in solidarity with Joseph Beuys’s 7,000 Oaks project—remaining on site for the duration of the project. Birds-Eye View: Back in April, Carl Bolander and Sons used a drone to capture progress on the Walker’s upper garden, which opens to the public—along with a new main entrance, hillside walking path, and new restaurant—in early winter. 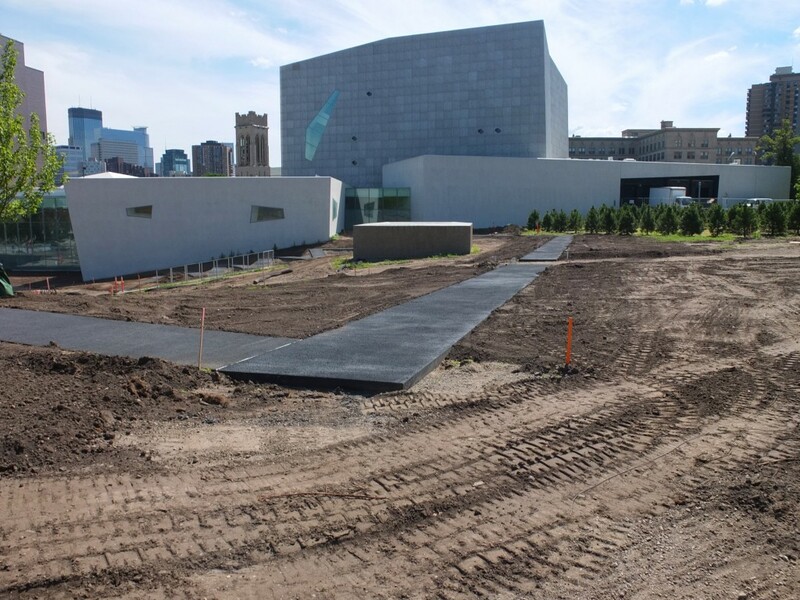 Since the photo was taken, renovation of the sculpture garden has begun, and on the Walker hillside, conifers and deciduous trees have been planted, concrete pads for sculptures have been poured, and the new entry plaza have begun to take shape. 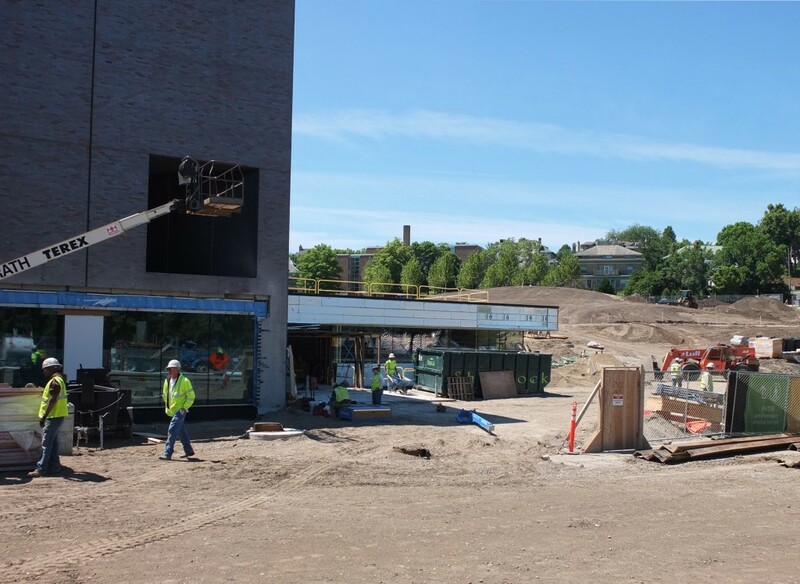 On the north side of the Walker, the dramatic Vineland Place entrance will open to a new restaurant, lobby, and gift shop, as well as the cinema. Under a green roof, a glass wall facing the Minneapolis Sculpture Garden will offer stunning views of the upper and lower gardens for diners at the Walker’s new restaurant. 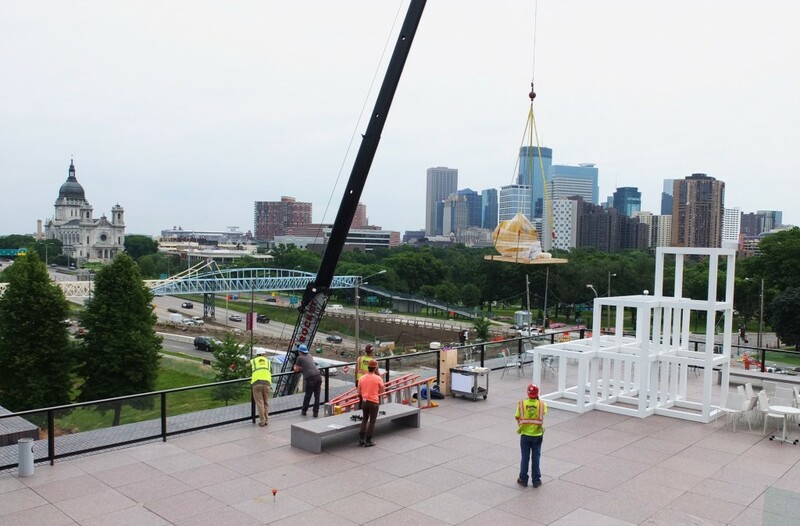 Learn more about progress on the Walker/Minneapolis Sculpture Garden renovation project.